Butteries are named after their high lard content. They are also known as morning rolls and rowies and are a traditional Aberdeen roll. The best way to describe their look and taste is a saltier, flatter and greasier Croissant. 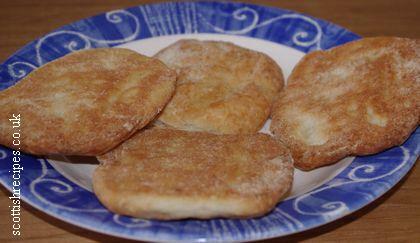 Which doesnae sound nice, but rowies are really delicious and filling for breakfast. Aberdeen butteries can be eaten cold and many shops, garages etc sell them pre buttered for anyone snatching an on the go breakfast. I love them toasted, buttered and with strawberry jam, washed down with a mug of tea. Chalmers bakeries make the best. 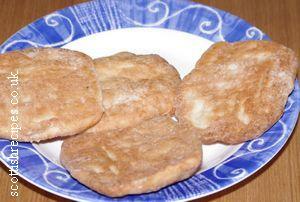 I've never seen them sold outside of Scotland, so below is a buttery recipe to make at home. There are now vegetarian butteries on sale in many shops. This Aberdeen buttery recipe should make about 16. 8. Repeat stages 5-7 of this Aberdeen butteries recipe twice more. 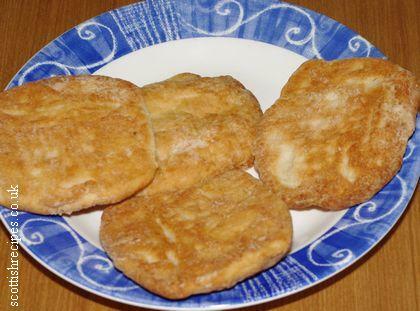 The buttery, or Aberdeen rowies as they are called in the North East of Scotland, was said to have been invented or rather created by a local baker for an Aberdonian fisherman. He disliked the hard biscuits that were the standard ration aboard ships. He asked the baker to make a roll that could be taken with the rations at sea and not go hard. The lard, dough and salt mixture of the buttery was ideal for storage in the sea conditions and soon became popular amongst seafolk and their families. 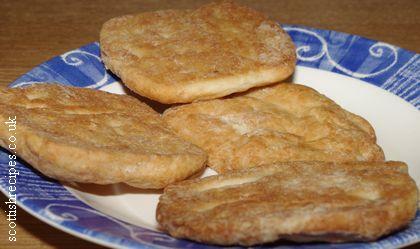 Aberdeen butteries popularity soon spread making it a popular breakfast dish amongst Scottish people. The first world buttery championship was held in Aberdeen on the 16th June 2018 at the North East Scotland College (NESCOL) Aberdeen City Campus. It was organised by the Slow Food Aberdeen City and Shire. 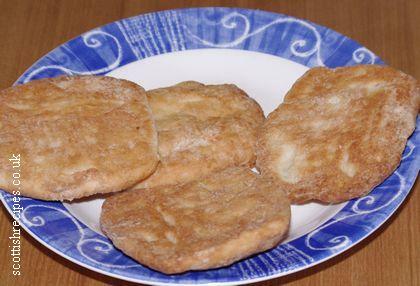 The Maw Broon's Cookbook has a butteries recipe much like ours though it uses slightly different ingredients such as plain flour, fresh yeast and caster sugar. It names the process of leaving the buttery dough to rise as being called the proving. The Hairy Bikers' Food Tour of Britain by Si King and Dave Myers has a delicious rowies recipe which they cooked live at Stonehaven square in Aberdeenshire and were a hit with shoppers. In their book The Hairy Bikers' Food Tour of Britain Si King and Dave Myers suggest their tasty tip of adding grated cheese to the butteries dough mix and serving spread with marmite. In May 2009 Chalmers Bakery of Aberdeen Scotland introduced delicious all butter butteries to their bakery range. They are suitable for vegetarians since they are made with butter rather than lard. Doctor Gillian McKeith the television health guru who presents the TV programme You Are What You Eat on channel 4 and a Scot thinks that Scottish butteries should be banned because of their high salt and lard content. On a visit to Aberdeen in 2006 Gilliam McKeith declared that the Aberdeen Rowie should be banned. Then on the 6 February 2007 Gillian McKeith had another go at the fat content of the Rowie in her new TV programme You Are What You Eat: Gillian Moves In. She was helping Edinburgh lass Lynsey who ate Rowies most days to lose weight and lead a healthier life. Now Gillian if you are reading - Gonnae no dae that! We love the Rowie and life's too short! Besides I eat mine with strawberry jam and that counts as a fruit portion - aye?! I wonder what Gillian did with that sack of rowies - I'd have loved to have filled my freezer with them! On a serious note Strawberry jam does not count as a fruit portion and Aberdeen Rowies, on average and depending on the ingredients used by the baker, contain 10 grams of saturated fat per 500g of fat. So do please only eat as an occasional treat, lead an active lifestyle and eat at least 5 portions of fresh fruit and vegetables a day - otherwise Dr Gillian McKeith will invite you to her house in London! Terry Wogan came to Aberdeen in 2005 as part of the Radio 2 Roadshow and was inundated with samples of rowies from bakers. He didn't like them and likened the taste to "seaweed and sea water"! Bakers are worried about the future of Aberdeen butteries though because few youngsters are coming forward to train as bakers. Many baker apprenticeships are going unfilled and leading Aberdeen bakers think it is because modern youngsters do not like the early mornings! Sadly this could harm the making of the Aberdeen buttery though some such as Chalmers who make about 6000 rowies a day are having to employ workers from the European Union. It is not just the traditional breakfast rowie and rolls that are at risk but other Scottish baking products like pies and bridies with the anticipated shortage of skilled Scottish bakers. Though modern day bakers start work at 5am rather than much earlier than would have been needed decades ago it sadly seems that the Aberdeen butteries could be a treat of the past and the modest rowies recipe be read in history books. Taste Ye Back: Great Scots and the Food That Made Them has a recipe for butteries that makes about fifteen. Other Butteries recipes can be found in the book A Cook's Tour of Scotlandy by Sue Lawrence and in The National Trust for Scotland book The Scottish Kitchen by Christopher Trotter.